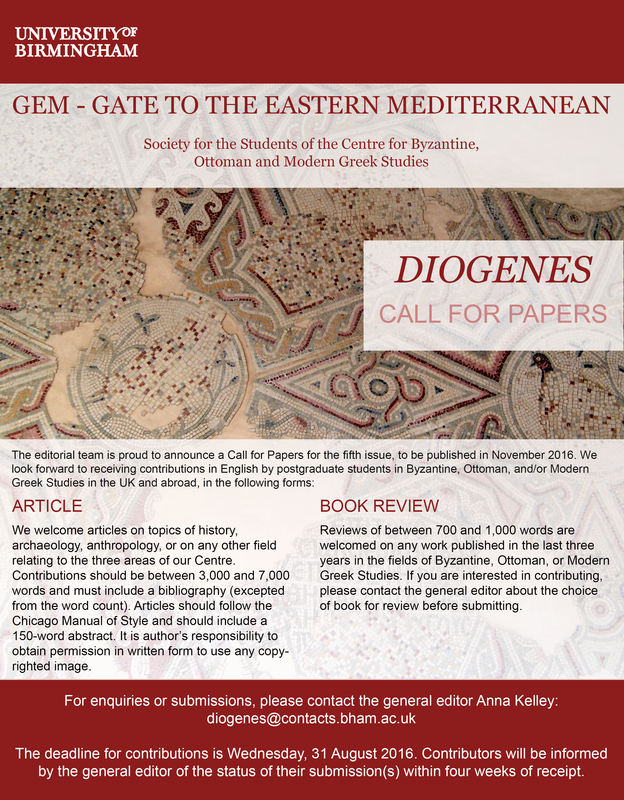 The editors of Diogenes are welcome to announce the Call for Contributions for the next issue of Diogenes to be published in October 2019. The deadlines for contributions is the 30th of May! The editors are pleased to present the seventh issue of Diogenes! The specialist editors for Issue 7 were Michael Burling, Alessandro Carabia, Christina Christoforatou, Laura-Marie Clark, Alex M Feldman, Marianna Georgouli, Vicky Kaisidou, Francisco Lopez-Santos Kornberger, Stephanie Novasio, Joseph Parsonage, Anastasia Tantarouda-Papaspyrou, Maria Vrij, and Lauren Wainwright. The Call for Submissions for Diogenes (7.2) is now closed. Thank you very much to those who submitted their papers. Authors will be notified by the general editor within a month for the status of their submission. The editors are pleased to present the sixth issue of Diogenes! The present issue is a by-product of some of the papers presented at the PGR Colloquium on Multiculturalism from late Antiquity to Modernity organised at the Centre for Byzantine, Ottoman and Modern Greek Studies in June 2017 by Gemma Masson and Francisco Lopez-Santos Kornberger. The general editor is Vassiliki Kaisidou. The specialist editors for Issue 6 were Anastasia Tantarouda-Papaspyrou, Panagiota Vasilaki, Michael Burling, Laura-Marie Clark, Alex Feldman, Francisco Lopez-Santos Kornberger, Panagiota Mantouvalou, Joseph Parsonage, Flavia Vanni, Maria Vrij Lauren Wainwright. The editors are pleased to present the fifth issue of Diogenes! The general editor is Anna Kelley; the specialist editors for Issue 5 were Joseph Parsonage, Alex Feldman, Francisco Lopez-Santos Kornberger, James Baillie, Gemma Masson, Onur Usta, Flavia Vanni, Lauren Wainwright, and Theodora Panella. If you have any questions regarding getting involved in r submitting to Diogenes, please contact the editors at diogenes[at]contacts.bham.ac.uk. We welcome articles on topics of history, archaeology, anthropology, or on any other field relating to the three areas of our Centre. Contributions should be between 3,000 and 7,000 words and must include a bibliography (excepted from the word count). Articles should follow the Chicago Manual of Style and should include a 150-word abstract. It is author’s responsibility to obtain permission in written form to use any copyrighted image. Reviews of between 700 and 1,000 words are welcomed on any work published in the last three years in the fields of Byzantine, Ottoman, and/or Modern Greek Studies. If you are interested in contributing, please contact the general editor about the choice of book for review before submitting. The deadline for contributions is Wednesday 31st August 2016. Contributors will be informed by the general editor of the status of their submission(s) within four weeks of receipt.